Independent Agricultural Cooperatives in Cuba? Transición (Transition), the first independent agricultural cooperative established in socialist Cuba, was born in Loma del Gato, Santiago de Cuba province, on May 5, 1997. The reasons behind this decision, according to the farmers, included a lengthy and long-standing list of grievances that extends from the campesinos’ involvement in the guerrilla warfare of the late 1950s, their enthusiastic support of the 1959 revolution, and their subsequent disappointment with the collectivization process. They stated that the latter brought about a massive exodus to the cities, and a general apathy towards work from those who remained on the land. Some of these farmers became state agricultural workers, while others retained land and remained independent, producing mostly for self-consumption and some black-market sales. After 38 years, with no solution in sight, a group of these farmers decided to pursue a new and more independent avenue to solve their families’ basic needs. The cooperative was founded by 20 farmers with 80 family members. The productive land area consisted of 54 hectares, distributed to several crops as follows: 10.5 hectares (ha) on pastures, 13.5 ha on coffee, 7 ha on fruits and vegetables, and 23 idle hectares. Several months later,3 the cooperative included 11 families with 51 members (25 men, 11 women and 15 children). Of the 162 hectares of land, 67 ha were devoted to corn, cassava, sweet potatoes and plantains; another 67 ha contained livestock, and the remaining 28 ha were engaged in the raising of purebred horses. h. the right to fight in an organized form, and to sue the government to suspend all measures and regulations that hurt farmers, and are the cause of low productivity and impoverishment. A summary of a development plan for the cooperative was included in the constitutive process. It consists of specific tasks in the following areas: livestock (including electrification, damns, roads, etc. ), swine, apiculture, coffee, fruits, vegetables and cereals, aquaculture, basic necessities of life, equipment and basic material needs, and other projects. Adding each of the elements that compose the project, it amounts to a total of US$13,700. A well detailed explanation of the planning and execution of each of the tasks was later included in the development plan. Less than five months after the establishment of Transición, on September 23, 1997, the second independent agricultural cooperative was founded in Cuba. Progreso I (Progress I) was born in the Bejuquera valley, located in the southeastern part of the Niceto Pérez municipality, in the province of Guantánamo. A development project for Progreso I was completed on February 15, 1998. Its introduction contains valuable information about the cooperative. Most of its 34 founding members are descendants of families that migrated from the current province of Sancti Spíritus before the revolution. The cooperative has 148.5 hectares of land, mainly devoted to livestock and tobacco, although they also contain several other crops and fruit trees. The project documents state that, although the productive potential of the land is high, it is not achieved because of the farmers’ lack of interest in production, mainly due to the government’s poor support in terms of allocating resources and the low prices it pays (as the only buyer) for the products. The farmers’ living standards have deteriorated to a subsistence level. No organization defends the farmers’ interests since the National Association of Small Farmers (Asociación Nacional de Agricultores Pequeños, ANAP) does not fulfill that role. It is for those reasons that the cooperative was founded, according to the documents. The development project consists, as the one for Transición, of several specific tasks in the areas of livestock and poultry, tobacco, and fruit trees, together with a social program. The projected total cost of the project is US$36,000.5 The authors of the project stated that they had considered the policy of the Cuban government at that time regarding independent cooperatives which translated into the possibility that the government would understand and cooperate with it. The third independent cooperative, named Progreso II (Progress II), was established in San José de las Lajas, in the province of Havana, on February 27, 1998. Although this organization appears to be still active, no additional information about it was found. Adopting the name Portadores del Futuro (Bearers of the Future), the fourth independent agricultural cooperative was established in Vázquez, Puerto Padre municipality, in the province of Las Tunas, on July 10, 1999. The founders were eight families with a total of 42 members, and an area of 28 hectares devoted to the growing of vegetables and beans. They also expected to go into the raising of pigs and poultry. This cooperative was born when a private farmer in the village of Cautillo, Jiguaní municipality, Granma province, declared himself independent on August 15, 1999, and decided to follow the principles of the agricultural independent cooperatives. His 14 ha of land would be devoted to growing rice, corn, and viandas. Other farmers in the area were discussing the possibility of joining this cooperative to finally establish it with the name of Canaán. Their future plans also include the raising of sheep due to the regulations affecting other types of livestock. The National Alliance of Independent Farmers of Cuba (Alianza Nacional de Agricultores Independientes de Cuba, ANAIC) was born in Loma del Gato, in the province of Guantánamo, on October 25, 1997, after a meeting of the cooperatives Transición and Progreso I held in Santiago de Cuba. Almost one year later, on September 16, 1998, ANAIC met in Santiago de Cuba and released a statement influenced by the critical situation caused by the severe drought affecting the eastern provinces with the subsequent increase in the scarcity of agricultural food products. The statement included a proposal for the immediate elimination of all control measures that hinder the commercialization and movement of agricultural products from the countryside to the cities. 6 In the conclusions of the document, the farmers stated that the situation forced them to act fast and with responsibility without regard for political interests that only serve to hinder the necessary take-off of production. In a document written to celebrate ANAIC’s first anniversary, the association proposed—with all due respect and considering his Moncada program—to invite President Castro to a dialogue with the purpose of explaining their objectives, which they understand to be feasible and capable of producing solutions to the food production problem. ANAIC considered a meeting with President Castro to be necessary. At this meeting, campesinos would state, with all clarity and without fear, what the problems of Cuban agriculture are and how to solve them. They reiterated the non-political and revolutionary nature of their endeavors, which are aimed at benefitting the nation. They finally stated that a dialogue, under equal conditions and within a framework of mutual respect and understanding, was the best avenue to respond to challenges and a civilized way to seek solutions. In April 1999, the two top leaders of ANAIC returned to their cooperatives after a short trip to the capital. In Havana, they visited several embassies to discuss their project, which they expected to translate into more tolerance from the government since they gained the support of Spain, Canada and Switzerland. The topic was also discussed in the Center of Social Cuban Studies (Centro de Estudios Social Cubano), in a session of the Reflection Table (Mesa de Reflexión). The cooperative leaders received unanimous support of participants. When Transición was founded (May 1997), its development project stated that its members believed that the policy of the Cuban government with respect to independent agricultural cooperatives at that time seemed to be one of understanding and cooperation, which would facilitate such development project. On February 15, 1998, the development project of Progreso 1 also contained similar statements. In addition to the Cuban government’s attitude expressed above, this document undervalued many of its projects because of the belief of a possible compensation by the government. Time would prove them wrong. One year after the first independent agricultural cooperative was founded, the three independent coops, together with the ANAIC, decided to hold their first congress in Loma del Gato on May 5, 1998. Letters of invitation were sent to General Raúl Castro (Vice President of the Government), and to Ricardo Alarcón (President of the National Assembly). The letter to Vice President Raúl Castro reminded him of the farmers’ positive response to his call to the First Campesino Congress in Arms, held in the mountains of the Second Oriental Front Frank País in 1958. The letter went on to state that it was the farmers who invite him now in the search for solutions which would benefit both farmers and the homeland. The topics for discussion included those related to the farmers’ daily existence, their economic difficulties, the production and development plans of the independent cooperative movement (which they hoped the government would legitimize at least in an experimental manner), and the road to take Cuban agriculture to a growing, advanced, and modern development. The letter to Ricardo Alarcón reiterated the farmers’ belief that their experiment, if approved by the government, could change the prevailing stagnation of the agricultural sector and even be applied to other sectors of the economy. It also stated that a bottomup approach was necessary since all government experiments had failed. Neither letter was answered. In a letter to the president of Cuba’s National Assembly of Peoples’ Power, dated May 10, 1998, ANAIC denounced the reasons for not being able to celebrate their first congress: use of force by governmental units, including the Rapid Response Brigades, the State Security Police, and the regular police forces. Support for the idea of a congress of independent cooperatives has continued to grow. 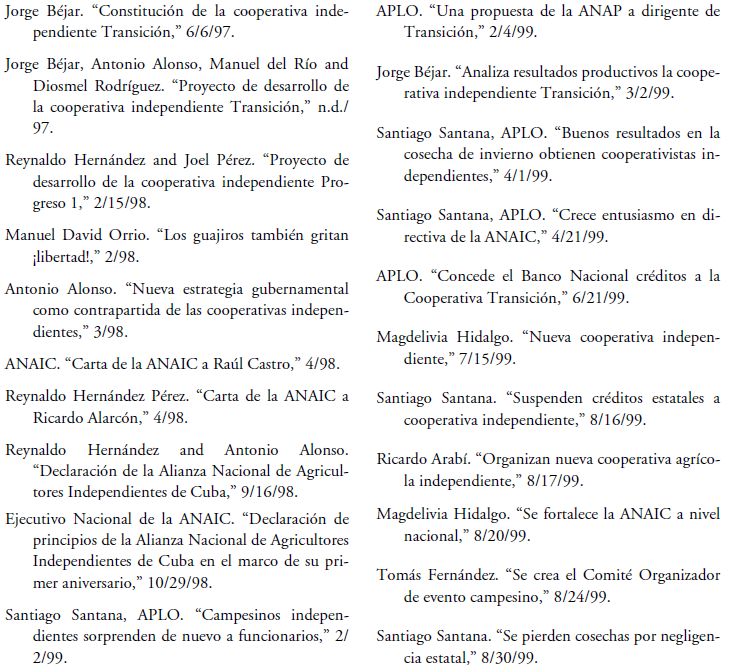 In mid-August, 1999, ANAIC announced that the second congress of independent cooperatives would be held in Matanzas province during the month of November, 1999. The specific site chosen was the farm La Paulina in the town of Perico. The organizing committee, and several commissions, were established in a meeting held at the same place on August 21, 1999. At the beginning, the independent cooperative members had an attitude of moderate optimism. The cooperatives received visits of agricultural and state authorities with the objective of holding a dialogue, and to know about them rather than repress them. Furthermore, the political police told them that, as long as the movement was of an economic nature, it was not their business to interfere. This attitude, however, would change. In addition to the force employed not to allow the celebration of the independent farmers’ congress described above, the Cuban government has employed other measures aimed at making the independent cooperative movement fail. Cooperative members have been detained on the streets of several towns; others have been summoned for interviews with State Security, where officers have tried to convince them of the futility of their efforts. Perhaps the most relevant government action to doom the independent cooperatives has been the attention recently given to the members of the Cooperatives of Credit and Services (CCS) under a reorganization of the agricultural sector called Fortalecimiento del Sector Campesino (Strengthening of the Campesino Sector). The government held a meeting in the Songo-La Maya municipality, in Santiago de Cuba province, with the objective of consolidating three CCSs under the new structure. They promised that the campesinos would have everything they needed. After asking a series of pertinent questions, the campesinos stated that it was about time to realize that Cuba’s agricultural problem is not one of new names or capable leadership. They even stated that it is not a problem of more or fewer resources; new names and publicity, according to them, will not feed the population, particularly with more government controls and less autonomy. Only when the working man can be entirely independent, will Cuban agriculture solve the current food problem. A potentially important change of government policy with respect to the existing independent cooperatives was only in place for a short period of time. During a first visit to the offices of the Cuban National Bank in the Songo-La Maya municipality, to apply for credit for coffee production, Transición officials were told by the bank director that she did not know if she could grant credit to independent farmers’ organizations. She promised to consult the case with higher authorities. During a second visit, in mid-June 1999, credit was granted only with the condition of meeting the financial requirements. In mid-August of the same year, however, bank officials informed the vicepresident of Transición that the credit granted the previous month for coffee production had been revoked. The cooperative members considered this another negative policy of the government towards them. The representative of ANAP in the Songo-La Maya municipality proposed the vice-president of Transición the presidency of the CCS “Manuel Guardia,” located in the same municipality, despite the fact that this individual had been expelled from ANAP years before. The independent leader turned the offer down saying that it was a governmental tactic to reincorporate the independent cooperative members to the ANAP. ARE THE INDEPENDENT COOPERATIVES SUCCESSFUL? • The members of the independent cooperative Progreso I were congratulated early in 1999 by leaders of the official National Association of Small Farmers (ANAP) for their success in planting the tobacco variety Pelo de Oro, instead of the officially-recommended Habana 92 variety. Since the enterprise Cubatabaco had not delivered any inputs to the cooperative members, they refused to sell the government any part of the production obtained. • At the end of February 1999, the cooperative Transición summarized its harvesting results for 1998, including four harvests of corn, one of sweet-potatoes, one of cassava and one of rice. For the first time they obtained a surplus that allowed them to sell their products directly to consumers. For internal consumption they obtained ñame, malanga, plantain, pumpkin, beans, and various vegetables. As a result of the increase in the production of grains for animal feed, the raising of hens and swine increased. Despite this apparent success, they recognize their yields to be poor due to a lack of inputs, especially working tools. • Why, despite the time elapsed since 1997, when the first two independent agricultural cooperatives were established, only a few more independent farmers have followed their example? (Table 1). The question is a tricky one. I believe that the answer could be two-fold. First, fear of the government in general. And second, fear of ANAP’s and Acopio’s reprisals. Could it be possible that the rest of the independent farmers are happy with what they have and have no intention of embarking themselves in such adventure? I honestly have serious doubts. Independent farmers are not forming more independent cooperatives but they are joining ANAIC in most provinces of the country. And that is really telling us something! The bottom line is that, to be successful, an independent agricultural cooperative movement in Cuba must be a massive one and be able to receive, from other sources, the basic inputs they cannot receive through official channels. This is perhaps the best answer to the question. • One of the issues raised by ANAIC is that of free markets: “the products would be sold at the best time and place, and to the best customer, the state being just one of them.” My assessment of this goal comes from a personal experience. In one of my trips to the Cuban countryside, I visited, with two of my Cuban colleagues, a private farm owned by a farmer named Cuco, located near the town of Güira de Melena, in Havana province, about 50 km south of the capital. It was in the month of August. The small farm had seven hectares “de cerca a cerca,” where he grows mainly grapes for the tourist sector combined with, depending on the year, a variety of 8-18 other crops for Acopio. He has an area devoted to the autoconsumo (self-consumption) of his eight permanent workers (at 15 pesos per day plus a ration from the autoconsumo plot). After looking at several areas of the farm, we sat in the living room of the house to talk while we drank a couple of bottles of his homemade wine. For his planting plan he meets at his farm with the President of the local ANAP, an envoy from the section of the Ministry of Agriculture called “el privado” (the private one), and an Acopio delegate. Since he always overfulfills his plan (he doubles average production), he is usually allowed to carry it out. We were surprised when he stated that he belonged to the local CCS in order to be able to have access to inputs. If not, he would not be a member. When we asked what he thought about eliminating Acopio’s abusive farm prices, Cuco replied that he liked the concept of free markets but without eliminating the price guaranteed by the state (“You produce ==> I buy ==> I pay”), whether ANAP needs the product or not at harvest time. In that way, he would not be completely exposed to the vagaries of the market. When we asked him why he remained independent despite the continuous problems, Cuco replied that his land had been owned by his family for several generations. When his father died, he made him promise that only dead would he abandon that land. This may be another answer to the question above. Cuco is so organized and efficient, that it would be almost impossible to find matches among nearby neighbors to establish an independent cooperative. • Property ownership is another consideration. The independent cooperative members have stated that UBPCs are less profitable than CAPs and CCSs because the latter are owners of their land while the former receive the land in usufruct from the government. I have always had my doubts about this issue. There is even an economic methodology devoted to the study of the different stages from production to consumption, trying to relate bottlenecks or inefficiencies to property rights.7 I believe that the problem is one of lack of complete autonomy. Although the law that created the UBPCs is very explicit concerning the granting of autonomy to these cooperatives, it has never been applied. The author saw the difference in performance due to autonomy between the sugarcane UBPC “Antonio Maceo” and the corresponding sugar agroindustrial complex (CAI) Manuel Martínez Prieto visa- vis the neighboring CPA “Amistad Cuba- Laos” outside the city of Bauta, Havana province, in the summer of 1994. The CPA had standing sugarcane left in the fields for the next harvest, while the UBPC had none because the CAI had ordered the harvesting of all canes to fulfill the national sugar plan. When I referred to that difference (which is not a simple one), the CPA official who was showing us the farm was very explicit. He said that those canes were theirs and they were not going to sacrifice them because it would take several years to return to a normal production cycle. Almost six years have elapsed since the establishment of sugarcane and non-sugarcane UBPCs, and the topic of how to grant autonomy to these institutions is still the subject of a heated debate in Cuba. • Could independent cooperatives be the next form of agricultural organization in Cuba during the present regime? NO and YES. I say NO because they are the opposite of what the current leadership wants in the countryside. The period of reforms appears to have ended and changing agricultural organization again would lead to other changes we all know the government does not want. I say YES because the Cuban government has the ability to surprise anyone. If the current independent cooperatives, with very little or no help from the government, can demonstrate that they can produce beyond the official quotas assigned to ANAP members, then, if food import capacity diminishes because of lack of hard currency and a real food crisis is in the horizon, the government could allow more experimentation with these organizations. Perhaps one of the mistakes of the Cuban government has been to ignore, as a joint ECLAC/FAO document states, that “the way to rural development can hardly be found by excluding from consideration the main agent of that development: the peasant” (Ortega, 1986, p. 134). 1. For many months, the author struggled with the thought of what importance should be given to this topic in the literature. At the outset, there was very little information. Then, as events unfolded, and more material became available, the decision to write this paper was made. 2. Although a few of the topics discussed in this paper have appeared in some U.S. and foreign newspapers, the material herein presented is almost exclusively based on the information found in CubaNet, at http://www.cubanet.org/cooperativa/pagina.html. Rodríguez (1998) contains additional information. 3. The discrepancy between the figures that follow and the original ones has a logical explanation. The cooperative was established on May 5, 1997, although the document announcing it, is dated the following day. The separate document with a detailed development plan, although not dated, mentions the ANAI, which was established on October 25, 1997. Therefore, the changes in the number and composition of members and land resources must have taken place in the months following the cooperative’s establishment. 4. This document, and others, state that they follow some of the agrarian reform principles of the Orthodox Party, presented to the House of Representatives by Manuel Dorta Duque on May 15, 1947, the day Eduardo Chibás founded his Party. Most of the young fighters in the attack to the Moncada and Bayamo barracks in 1953 were recruited by Fidel Castro from the Orthodox Party, in which he was a militant. 5. It is interesting to note that both cooperatives intended to use the same bank account—C.B. No. 01864150733007—to operate with foreign exchange. It was opened by ANAIC in a bank located in Havana with a branch office in the city of Guantánamo. 6. Because of these control measures, those who transport agricultural products see them confiscated without regard for the significant quantities of products that are lost because of lack of containers and transportation, and the lack of governmental efforts. As an example of the former, in the Jutinicú area, in the municipality Songo-La Maya, Santiago de Cuba province, hundreds of quintales (100 lbs) of guava were lost in September 1998. If these bureaucratic restraints were eliminated, according to the independent farmers, agricultural activities would acquire a dynamism not feasible under current conditions. Similar situations were denounced at the end of August, 1999. Heavy losses were the result of the government-run Acopio not collecting the products at the proper time, which government officials blamed on the lack of transportation, fuel, and boxes. Another explanation was that the Acopio warehouses were full, which the farmers did not accept given the scarcity of food prevalent in the region.